Golf can be one of the most frustrating sports to learn. That is exactly why I created this section of Golf Fitness And Training Tips. Here, I have compiled beginner golf tips that are either from my own experience or that I have researched for this site. There is so much to remember when learning this great game that it can become overwhelming! Many people get so frustrated that they stop playing. But we don't want that to happen! That is where this page comes in! The beginner golf tips page is designed to help guide you as you begin your journey with the game of golf. 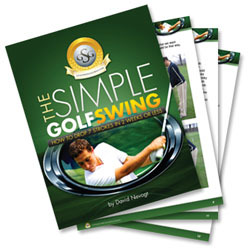 This will include specific pages for buying golf clubs, basic golf rules, beginner swing tips, and more! Everything on this page and its links are intended to be simple. Experienced golfers will likely have no use for these pages, but that's OK! It isn't meant for them anyway! It is meant for all inexperienced golfers out there, who are simply looking for answers to help them improve their game. Are you a beginner and have a question about a topic that isn't covered on the page? Click on "Ask The Expert" at the top of the left side of this page and I'll do the best I can to answer! The first series of beginner golf tips will focus on purchasing golf clubs. There are so many choices out there, so how do you decide? There actually is no correct answer, because it all depends on what works best for you. I firmly believe that new golfers should avoid the temptation of spending their money on expensive golf clubs until they have a solid grasp on the golf swing. You may try golf for a few months and find out that you don't even like it! There are many factors that go into purchasing golf clubs, so if you would like to read more, please click on the link below. In addition to leaning how to play golf, you also need to become familiar with some of the common golf rules. There so many rules to golf that it would be very difficult to list them all on one page. This page is dedicated specifically to some of the major ones, particularly rules that every golfer needs to know. Also, there is information regarding golf etiquette, such as which golfer hits first, and what to do (and not do) on the course. Finally, this page also explains golf scoring, and the terms associated with each score. This page is an essential read for anyone who is starting to just learn the game. Many of the rules are self explanatory but there are some, like in reagards to hazards, that can be confusing. If you would like to read more about golf rules and etiquette, please follow the link below. If you are just starting out, there is a whole world of golf terminology that will need to familiarize yourself with. There are golf terms for types of shots, scoring, specific hazards, and general areas of each hole just to name a few. This page is essentially an A to Z dictionary of terms. The best way to learn these terms is to get out and play, but if you need a crash course, please check out this page. While not necessarily a beginner golf tip, a great training aid that I have found and used personally is a training glove. These gloves provide visual feedback for exactly where to place to club in your hand for the proper golf grip. One of the most common flaws that golfers exhibit is an improper grip, which can lead to poor shots. Even turning your wrist a small amount can have a huge impact on ball flight and where it eventually lands. These gloves are relatively cheap and can been worn on the course or the range. If you are just starting out, making sure that your grip is correct is extremely important! Golf alignment refers to the relative position of your feet in relation to your intended target. It is one of the most common flaws of beginner golfers, but something that is also a very easy fix. This page will explore exactly what is an open or closed stance, plus a few quick tips in order to help your improve your stance and alignment.